Do you love classic cars, live music, and family fun? Then you&apos;ll want to head to the small community of Coatesville for the Third Annual Cruis&apos;in in Coatesville Car Show and Street Fair. 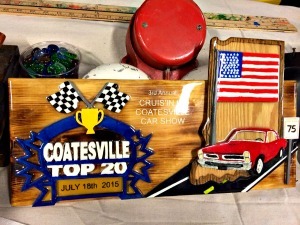 This unique event on July 18 blends famous cars, local classics, music and fun into one day in downtown Coatesville. Of course, the biggest draw to Cruis&apos;in in Coatesville is the cars. Visitors will be able to check out the Bumblebee Camaro from the Transformer movies, a Chevelle like the one used in the movie Jack Reacher, and the #2 NASCAR Stock Car of Brad Keselowski. Be sure to bring your camera and snap some pictures in the interactive displays designed around these cars. In addition to these famous cars, you can also see all the entries into the car show. Auto enthusiasts will show off their hard work as they feature their custom cars and motorcycles. One of the special things about this car show is the awards given to the participants. Each trophy is handmade, and no two are alike. There&apos;s even a "Pastor&apos;s Pick" trophy given to a car chosen by a local minister! If cars aren&apos;t your thing, there&apos;s still plenty to see and do at Cruis&apos;in in Coatesville. The band Pack of Chihuahuas will be providing live music during the event. There&apos;s also a "Kid&apos;s Korner" with games and fun for the little ones. Local vendors will also be on hand, selling arts and crafts and tasty treats. It&apos;s all the fun of an Indiana summer festival, combined with classic cars and motorcycles -- so there&apos;s something for everyone! I hear that Captain America may even make an appearance. 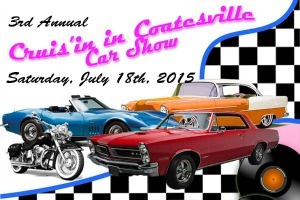 Are you planning on heading to this year&apos;s Cruis&apos;in in Coatesville? The event is Saturday, July 18 from 1 to 5 p.m. in Downtown Coatesville. Downtown streets will be closed off for the event, so follow signs for parking. A shuttle is available to take you from your parking spot to the event. If you plan to enjoy the live music from Pack of Chihuahuas, be sure to bring a lawn chair, as available seating will be limited. Be sure to vote for your favorite car to win the Fan Favorite award! Don&apos;t forget to bid on some of the amazing items in the silent auction, including autographed memorabilia from the Indiana Pacers. All proceeds from the event go to support the Coatesville Downtown Revitalization project.